The end of Milwaukee County Transit’s Route 10 service closes a century-old chapter in Milwaukee history. Read the full story at OnMilwaukee.com here. A friend was asking me just recently about the fate of the #10–I knew nothing about it. Looks like I’m going to find out. Thanks! Being as I live on the route, it’s be nice to have one of those signs hanging in the hallway to my upper flat. Got any ideas as to who/what office I could contact to see about getting one? 1. “There are those who keep out of mischief and then there are the adventurers.” *Juan Manuel Fangio* 2. “You’re only given one little spark of madness. You mustn’t lose it.” *Robin Williams* 3. âEvery day is a bonus,â motto of the Wisconsin-based Stars and Stripes Honor Flight. Coined by World War II veteran, Joe Demler, upon his liberation from a Nazi prison camp. He weighed just 70 lbs. 4. “There is no death, there is just a change of our cosmic address.” *Edgar Froese* 5. 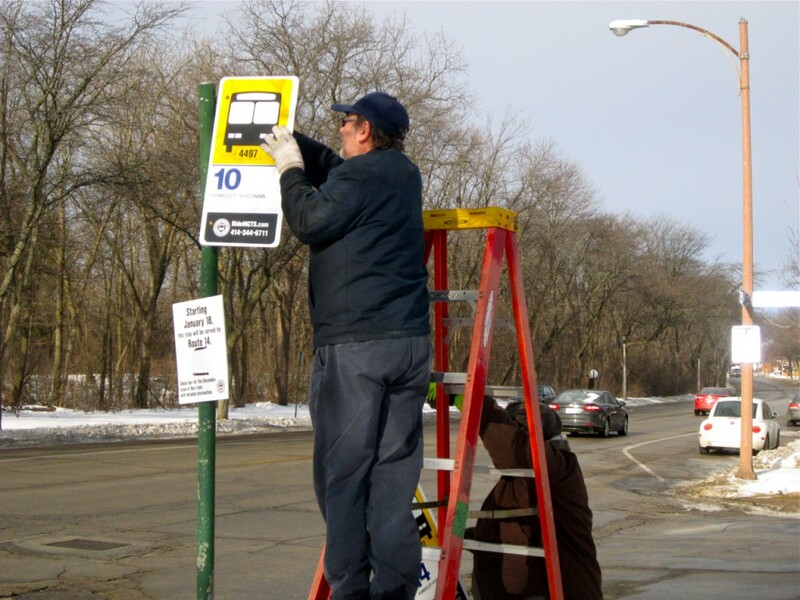 Douglas, John and I asked the workers removing the signs if we could have one, but it turns out MCTS reuses the signs — they are designed to make it easy to reprint with new numbers as bus routes change. Also, they told us they had already fielded a bunch of similar requests for signs that day!